July 31st was the deadline to file your 2nd Quarter IFTA return. If you did not file your return you will want to do it immediately to avoid further penalties and/or interest. ExpressIFTA is here to take the hassle out of preparing your IFTA fuel tax return. Many people dread the thought of having to file their quarterly IFTA return but with ExpressIFTA you can quickly and easily keep track of your mileage, fuel purchases and more at no charge. Entering your mileage and fuel details has never been easier with our quick entry system. There is no cost to sign up and there are no monthly fees or contracts with ExpressIFTA. You pay only when we prepare your IFTA fuel tax return. You can log your trips as you run them, so you don’t have to spend hours doing it at the end of the quarter. Our program will do all the calculations for you; all you have to be plug in the data. ExpressIFTA makes fuel tax reporting less taxing! To get started simply create an account and begin entering your trip sheet information, that’s it! If you have any questions along the way, please do not hesitate to contact our friendly USA-based Tax Team at 704.234.6005 or email us at support@expressifta.com. 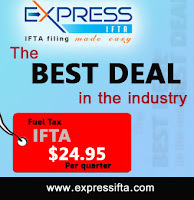 Why File IFTA Fuel Tax with Express IFTA?